CG Challenges are the largest online art contests of their kind, with huge amounts of sponsorship and publicity for each challenge. Working within guidelines and limitations, artists are challenged to create outstanding artworks based upon set themes. Sponsorship of a home CG Challenge will create professional 3D models for animations, 2D stills for pans and background mattes, unique Mars-centric art in general by professionals and students worldwide. Think of funding the prize pool of a CG Challenge as leveraging a few thousand dollars into the employment of a staggering number of the world best, most inspirational, space obsessed digital artists. Hundreds of space literate artists will spend tens of thousands of hours working for home's virtual art department. 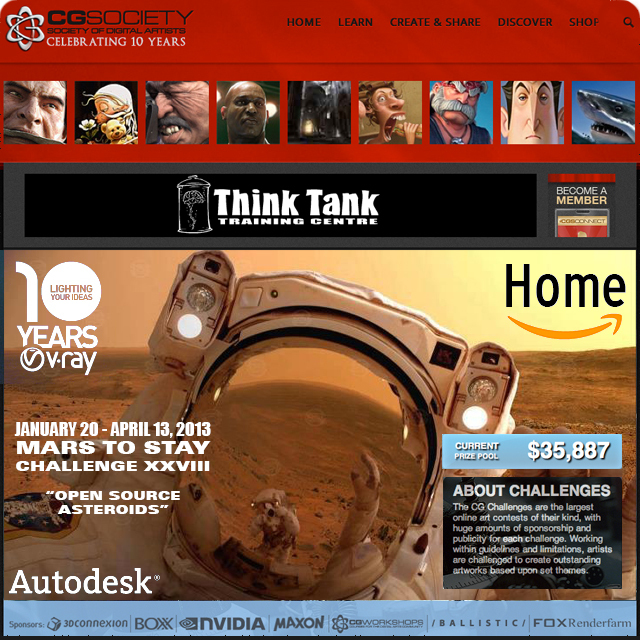 A CG Society Challenge such as this will elicit visions of future Mars settlements from creative people in countries as varied as El Salvador and Iran. Awe-inspiring artists' concepts are guaranteed. This would be a high-profile, news generating project. Artists' work could be republished in Popular Science, Wired, Air and Space magazine, mainstream newspapers, and for years to come permeate the internet with first-class Mars-centric concepts displaying the logo of Home, Blue Origin, and show sponsors. Artists could be enticed to donate their finished, textured, professional quality 3D models to an open source free archive used to promote future Mars-centric art. Such a Challenge would educate generations of digital artists about Mars, publicize the importance of near-term research settlements, and establish a massive unprecedented collection of scientifically literate concept art.